This pamphlet was prepared by the chairmen and secretaries of the People's Party and the Democrats. They were working on a "fusion" or merged ticket that would be supported by both Democrats and Populists. The pamphlet gives very specific instructions about how to attract Republican voters who are discontented with that party. It is addressed to party workers at the county level and advocates a very grass roots approach to the campaign. 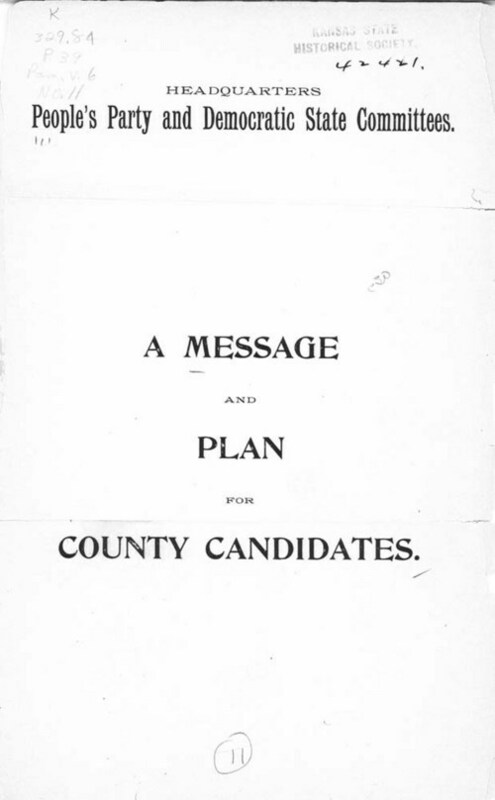 The Peoples Party chairman was W. J. Babb and the secretary was J. H. Curran. The Democratic chairman was H. P. Farrelly and the secretary was Chas. McCrum.